A very short dwarf at only 30 inches long. This wonderfully short, fat little Vienna Regulator has a zinc-backed bob and an exquisite small mechanism, telling me that it dates to perhaps 1860. Clearly Viennese by its quality and attention to details, this little clock will clean up wonderfully. The case in in very nice condition, with a few minor veneer challenges that would want fixed, it also wants two finials to the corner of the top, and a new bottom finial (the bottom one is only half there). 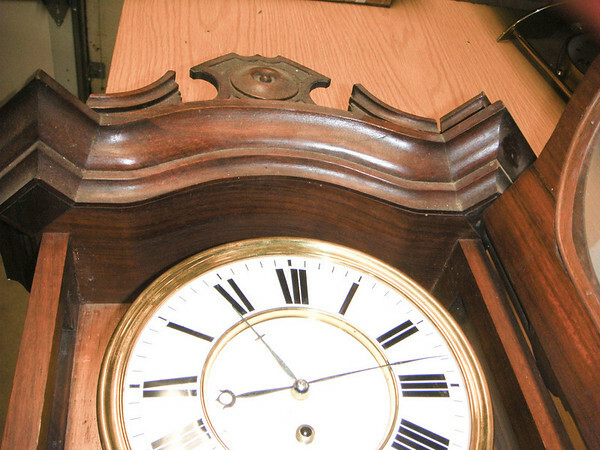 If you have a really good eye you will notice there is some trim missing to the top left part of the top of the clock. This trim is here, just needs glued on, and is not hurt or damaged. When looking the case over I noted the unusual door with glazing strips all the way around the back of the glass, and edges of the door set at 45 degrees to the body of the door, the very nicely done carving to the sides of the door, the exquisite Viennese mechanism, its dial with a couple of very fine hairline cracks that will disappear when cleaned, but otherwise absolutely perfect, and the very fine hands: When cleaned up this will be a little gem. Given the very short drop for this mechanism, I suspect I will really, really enjoy working on this mechanism – it has to be extremely well made. While only running a week, with its short drop, the mechanism has to be made to the standard of a month running mechanism with a longer drop. I shot this picture to show that the top of the case cavity is actually bowed - a very small detail, but one that really does take a lot longer to make - another sign of the overall quality of this miniature dwarf!